“Voting in elections is considered sacrosanct by a large majority of Indians,” Mukulika Banerjee writes in the introduction to her new book, “Why India Votes.” That observation forms the backbone of the anthropology professor’s work, an ethnographic study of 12 sites in India during the 2009 general elections, which explores the motivations and opinions of Indian voters on a range of issues related to the electoral process. As part of the Jaipur Literature Festival’s theme “Democracy Dialogues,” Dr. Banerjee, who is the associate professor of social anthropology at the London School of Economics, participated in several discussions on India’s social and political evolution. While conversations and questions during the panels often zeroed in on this year’s political players like Narendra Modi, Rahul Gandhi and the Aam Aadmi Party, India Ink spoke with Dr. Banerjee about the other factors motivating voter turnout, and why the act of voting is so meaningful for the majority of Indians. Why India votes is a huge political question, but your book is actually an anthropological book and an ethnography. What is it about ethnography that lends itself useful to the study of politics? One is that you don’t ask people questions all the time. You also do a lot of observing. You then can see what people do and what they say, and often these two things are not the same. People will say, for instance, “I’m never going to vote. I’m so angry with my M.L.A. [Member of the Legislative Assembly]; he’s done nothing for us.” And then you show up on Election Day and there they are, in the voting queue. The second thing is that you’re also not just talking about politics. You’re interested in them as people, and all the different roles that people fulfill add to their role as a voter. What surveys have shown, and what we have tested with the ethnographic method, is that the voter turnout figures from small-town India, or from rural, poorer, illiterate, low-caste India, were much higher than other parts of the country. But that is now also changing. The urban voter who was very apathetic in the past is voting more now. And so we see these big macro trends, and what we’re trying to then understand is the meaning. What are the other macro trends you’re alluding to? If you look at the publications of the national election studies, they show that voter turnout in India always goes up the more local the election, for instance. Women vote in similar numbers to men, the poor vote more than the rich. The point is that people value that for one day, it doesn’t really matter whether you’re a man or a woman, or whether you’re dark skinned or light skinned, or whether you’re low caste or high caste — that is the leveling effect of the vote. You mention in your book that in 2009, a lot of viral text messages would veer people one way or another politically. Social media — Facebook and Twitter — is much bigger now. What do you see the role of this technology playing in this year’s elections? The mediation between the candidate and the voter through the media is something that frustrates a lot of politicians. One of the big clampdowns by the Election Commission was on election expenditures, so publicity material became less. One of the unfortunate outcomes of this was paid news, so aspiring impoverished candidates who wanted to communicate with their voters really had no other way. They were reliant on the media. What social media does is give them direct access to people, and then this flows back, because then people feel that they can have the ear of their candidate directly. But what about the poor populations of India who don’t have Internet access and would rarely get to see a candidate? How are they then perceiving their vote? Is the vote about the issues or is the vote about themselves? It’s about both. It is very much about how important it is for them to participate and to be counted. People will say it’s a vote for recognition — because if for the rest of the time the country forgets about us, at least you can be counted literally. Do you think there is anything the media is missing right now in covering the elections? As the election campaign intensifies, it becomes so personality-driven, especially in an uncertain election like this one. And this tends to get fixated on a few people. Now, there are 543 constituencies and an average of five or six people contesting each seat. Who are these people? What are their backgrounds? What kind of wealth do they have? What kind of party organization are they using? How are they running their campaigns? What are their innovations? These stories just don’t come up enough. You can do the story you think everybody wants to read. But India is full of surprises. 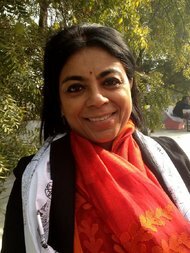 Sonia Paul is a freelance journalist based in Lucknow. You can follow her on Twitter @sonipaul. This piece was originally published on January 20, 2014, on the New York Times.